The new Ceed Sportswagon (sports estate ) has just gone on sale here, joining the new Ceed five-door model that arrived in Ireland in July. The Ceed SW comes here inititally in just one trim level K3, available with the 1.0-litre T-GDi (turbocharged petrol direct injection ) engine at €25,295, and the U3 1.6-litre CRDi 115 PS (common-rail direct injection ) diesel unit at €27,595. This new 1.6 diesel engine uses selective catalytic reduction (SCR ) active emissions control technology to significantly reduce emissions. As a result, the new engine produces less carbon dioxide, particulate matter and NOx, compared to earlier Kia diesel engines. However, it also produces 280Nm of torque, providing effortless acceleration in all conditions. Designed, developed, engineered and built in Europe, this third-generation model is the most practical, spacious and versatile Ceed Sportswagon to date, with more cabin and cargo space than its predecessor. A C-segment tourer designed to meet the needs of European motorists exclusively, more than 500,000 Ceed Sportswagon models have been built at Kia’s Slovakia manufacturing facility since its introduction in 2007. Historically, sportswagon models have accounted for around 40 per cent of all Ceed sales – compared to around 30 per cent for other C-segment vehicles with tourer variants. Like its predecessors, the new model has been designed, developed and engineered in Frankfurt by Kia’s European design, product development and R&D teams. It will continue to be manufactured in Žilina, Slovakia, on the same production line as the new Ceed five-door hatchback, and the Kia Sportage and Kia Venga. James Brooks, managing director, says the Kia Ceed Sportswagon is a welcome addition to the new Ceed range. 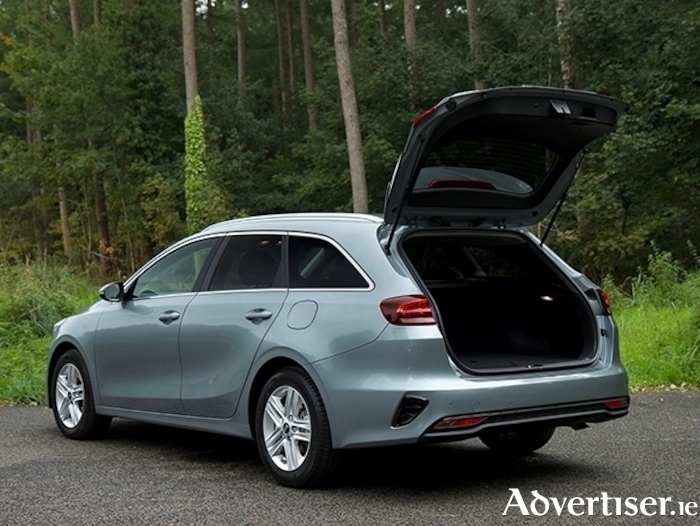 "Wagon sales in Ireland have softened in recent years, but a model like this with luggage space greater than most D segment tourers, is an attractive proposition for both private and fleet buyers in Ireland. The new model’s body echoes the sporty design character of the Stinger, bringing design flair to the compact tourer class with emotive and precise details to its confident tourer silhouette. Lower, wider, and with a longer rear overhang than the car it replaces, the new Ceed Sportswagon is characterised by a cab-rearward silhouette, creating a mature athleticism in its overall design. The new model features ‘ice cube’ LED daytime running lights as standard, echoing those from the outgoing Sportswagon GT-Line. Constructed on Kia’s new ‘K2’ platform, the Ceed Sportswagon is 20mm wider (1,800mm ) and 20 mm lower (1,465mm ) than the outgoing model. Its wheelbase remains the same at 2,650mm, with the front overhang shortened by 20mm (to 880mm ). However, the rear overhang is extended by 115mm (now 1,070mm ) – making the new Sportswagon 95mm longer (now 4,600mm ) than its predecessor to create significantly more cargo space. Its wider dimensions and cab-rearward silhouette create a more assertive and sporty stance, for a more confident presence on the road. Interestingly. the rear suspension has been subtly tuned to accommodate the longer rear overhang of the boot, and the potential for larger, heavier luggage loads than the five-door hatchback. The new platform supports a more spacious cabin than before. The wider body creates greater shoulder room for rear passengers while a 15mm-lower seating position in the rear creates more knee and leg room for passengers in the second row. The new Ceed Sportswagon also boasts significantly higher cargo capacity than ever before. The boot is 72 litres (14 per cent ) larger than the outgoing model, expanding to 600 litres in capacity – larger than most D-segment tourers. The boot lip is also substantially lower – the lower lift-over height compared to the outgoing Ceed makes it easier to load heavier items into the boot. The new Ceed Sportswagon has been engineered exclusively for European roads, with European buyers in mind. The ride and handling characteristics of the new model have been tuned to elevate the Ceed over its predecessor in terms of dynamism and driver engagement. Try it for yourself - take a test drive if you are interested is a stylish small-family size estate.